New York based Sandy Boyer is the co-host of “Radio Free Eireann” broadcast Saturdays at 1pm on WBAI, 99.5 FM, or wbai.org. He has helped to mobilize support for political prisoners including Marian Price, Roisin McAliskey, the Birmingham 6, Pol Brennan and Joe Doherty. Here he outlines the continued threat to human rights in Northern Ireland. Internment without charge or trial is back; “special” political offenses are being used to muzzle political activists; and the police have intimidated witnesses. Internment was formally ended in 1975. But now it is being used against former political prisoners who are imprisoned indefinitely because their “license” (parole in American terms) has been revoked. They are never told why it was revoked and not even their lawyers can see what evidence, if any, is being used to keep them in prison. Martin Corey has spent more than three years in Northern Ireland’s Maghaberry Prison. He is imprisoned indefinitely without a charge, trial, sentence or release date because the Secretary of State for Northern Ireland, a British Cabinet Minister, has revoked his license. There is very little chance of that he will be released any time in the foreseeable future. Martin Corey received a life sentence in December 1973 when he was 19 years old for killing two members of the Royal Ulster Constabulary, the Northern Ireland police force, in an IRA operation. He served 19 years and was released in June, 1992. Last year a Belfast judge ordered him released on unconditional bail because he was being held on the basis of secret evidence. His family rushed to the prison to bring him home. 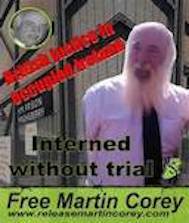 But while Martin Corey was sitting in the prison reception area and they were waiting outside, the Secretary of State for Northern Ireland overruled the judge and ordered him re-arrested. His lawyers have announced that they will appeal to the European Court of Human Rights. But it could be years before any appeal is even heard, let alone decided. 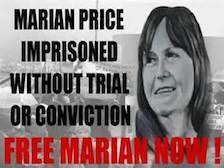 Marian Price was held in solitary confinement for more than two years after the Secretary of State for Northern Ireland announced that he had revoked her license. Neither she nor her lawyers were allowed to see the evidence against her. Twice judges ordered her freed on bail. Twice the British Secretary of State for Northern Ireland overruled the judge and ordered her back to prison. After Marian Price was returned to prison in 2011 her health deteriorated so badly that she had to be moved to a hospital. Even after she was in a wheelchair, there was a prison guard stationed outside her door 24 hours a day. She was handcuffed for family visits and even during medical tests. When the Parole Commission finally released Marian Price she was suffering from pneumonia, arthritis so severe that she couldn’t open her hands and the anorexia she developed during her hunger strike had returned. Stephen Murney is in Maghaberry Prison charged with “collecting information likely to be to the use of terrorists” and “distributing information likely to be of use to terrorists” because he took photographs of members of the Police Service of Northern Ireland at political demonstrations. He published some of these photographs in local newspapers and posted others on facebook. He also saved images of protests in Northern Ireland over the last 45 years on his computer. Stephen Murney was arrested on December 1, 2012 and remanded to Maghaberry pending a trial. He is still there today and no trial date has ever been set. He was offered bail but only on condition that he not live at home with his partner and their child, never enter his home town even to visit a doctor or his family, never attend a political meeting or event and wear an electronic monitoring device . He rejected these conditions. 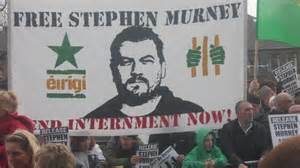 Stephen Murney is a well known political activist in the Newry area of Northern Ireland. He is a prominent member of Erigi, a legal political party throughout Ireland. The Police Service of Northern Ireland tried to intimidate a witness who could have discredited the murder convictions of Brendan McConville and John Paul Wooten. They are serving 25 years (McConville) and 14 years (Wooten) for killing Police Constable Stephen Carroll. Their conviction rested on the testimony of a man known only as “Witness M” who said he saw the two men leaving the scene of the crime. The defense team located a close relative of “Witness M” who swore in an affidavit that “he was known in the family as a Walter Mitty that he made up stories, that he had a fertile imagination and you could not believe anything he said.” According to this relative, Witness M could not have taken the route he claimed on the night of the killing because his partner was not welcome in his home. After this affidavit was submitted to the Court of Appeals the police forced their way into this man’s home and threatened to discredit him if he testified at the appeal hearing. Shortly afterwards he was arrested, held for three days, and questioned about his possible testimony. The case has been adjourned until October. Even if McConnville and Wooten are freed then, they will have spent four and a half years in Maghaberry Prison.